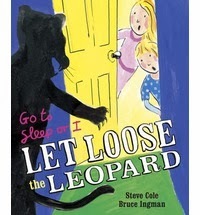 Go to Sleep or I Let Loose the Leopard is a new picture story book by Steve Cole and Bruce Ingman. Go to Sleep or I Let Loose the Leopard features a little girl and a buy who have been left with a babysitter for the night and decide to play up. The babysitter tries every trick up her sleeve to try and get them to settle down, but to no avail. Eventually she threatens them with her trump card... the leopard. And guess what, it turns out that all of her hollow threats weren't so hollow after all. Lara really enjoys me reading this to her - I think that Lara is most fascinating in the tales of the naughty games that Ellie and Joe get up to at bedtime. I suspect it has given her a few ideas! I recognised a lot of myself in the babysitter and her threats of what might happen if the two of them didn't hurry up and go to bed. Lara and I both laughed together at the very last page of the story... Lara was initially scared that there was a real leopard on the loose and it might hurt the children until we turned to the last page and she realised it wasn't meant to be scary. We found the story very easy to read together and the brightly coloured pictures certainly got both Lara (4) and Holly (1) very interested. I would recommend Go to Sleep or I Let Loose the Leopard for children from about 2 to 7 years old as a fun evening read together with parents. It has been a good talking point for me and Lara to discuss her bedtime routine and how she would behave at bedtime when we are away.